The locomotive built this way to put maximum weight on top of the drivers are called "Camel" steam locomotves. The locomotives built with very wide fireboxes with the cab situated in front of the firebox are called "Mother Hubbard" steam locomotives. "Camel" steam locomotives were designed and built by Ross Winans around 1847 and 1848. These locomotives had the cab located on top of the boiler perhaps like a saddle on a camel's back, yet had narrow fireboxes situated between the driving wheels. These Camel type locomotives were mostly of the 0-8-0 wheel arrangement and had the cab centrally lococated so that maximum weight was centered over the driving wheels. Ross Winans did not like to use leading or trailing wheels because that would remove some of the weight from the drivers. These locomotives, were originally called "Camels" and sometimes (maybe incorrectly) "Camelbacks". 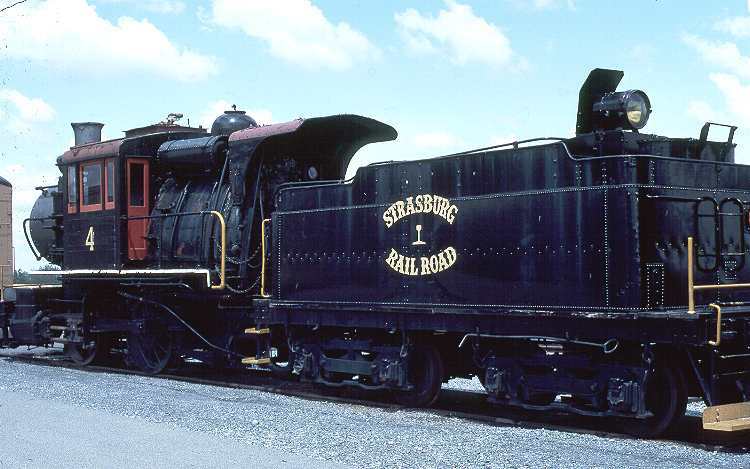 "Mother Hubbard" steam locomotives had the cab situated in front of the firebox because the firebox was so large that a cab would not fit around it. These large fireboxes were called "Wootten" fireboxes and were designed to be that large to burn larger quantities of low-grade coal. Mother Hubbards were built mostly after 1877. It is not clear how these locomotives came to be known as "Mother Hubbards", but they too are often (maybe incorrectly) called "Camelbacks". Most of the photos and locomotives descrived in these pages are technically "Mother Hubbards". The anthracite coal-carrying railroads of eastern and central Pennsylvania burned the very product that they carried from the mines to the market. Out of this close association, a steam locomotive was developed that allowed these roads to burn the cheapest grade of this abundant fuel. An individual who played a major role in this development was John E. Wootten (1822-1898). Wootten began his association with railroading in 1837, as an apprentice with the Baldwin Locomotive Works. Later, in 1845, he joined a railroad that became part of the Philadelphia & Reading Railroad and rose through the ranks to become the Superintendent of Motive Power of the P & R Railroad in 1866, and the General Manager of the entire Reading system in 1876. At the time he became GM, anthracite or hard coal which burns slowly and with little smoke was used for home heating. This coal had to be screened to remove fine material and to carefully size the coal before shipping it from the mines. Waste anthracite known as culm, which resulted from handling and preparation, was piled high at the mines and amounted to almost 20% of production and had no commercial value. Anthracite coal was only found in eastern Pennsylvania, and the railroads that hauled the coal often burned it for fuel. Wootten, who had watched the piles of waste grow into small mountains, wanted to find a way to use this plentiful resource. He experimented with culm to find a way to use this abundant and cheap fuel. He concluded that a very low firing rate worked best and the Reading began to use culm in stationary boilers at its shops and stations. Culm did not burn well in the long narrow fireboxes that were typically located between the wheels of the locomotives of the day. A thick fire is required in these fireboxes and the heavy draft needed to keep them burning would blow the fine coal off the grate. In 1877, Wootten patented a boiler design that would burn the small sizes of anthracite. To accomplish this, the grate area was widened so as to make it about twice the size of those in use at the time without increasing the distance that the fireman would have to throw the coal. A combustion chamber extended forward into the boiler barrel and was separated from the firebox by a bridge wall. The large grate allowed the culm to be spread in a thin layer so it could burn with a moderate draft. Most, if not all Wootten locomotives had twin firedoors. Another feature of Wootten's original design (that did not last too long) were water cooled grates! Adapting this new firebox to a locomotive required it to be located above the driving wheels because its width would not permit it to fit between them. However, locating it in front of the crew cab obstructed the engineer's view. So the engineer's cab was moved ahead of the firebox and located astride the boiler and the fireman remained in the rear of the locomotive and was provided minimum protection from the weather. Here is a case where form followed function and a new type of locomotive was born which became known as a "Mother Hubbard" or more losely known as a "Camelback" or maybe more descriptively as a "center-cab locomotive". The "Anthracite Railroads" were very quick to adopt this new cost saving design and began to develop locomotives of all types. Most camelbacks were built as 0-4-0, 4-4-0, 4-4-2, 0-6-0, 2-6-0, 4-6-0, 0-8-0, 2-8-0, or 4-8-0. However, the following wheel arrangements were also used: 4-2-2, 2-4-2, 2-6-2, 4-6-2, 2-8-2, and 2-10-0. There were three 0-8-8-0 "Mallets" built by ALCO for the Erie Railroad in 1907 (see Locobase 5700) and a very unusual cross compound 2-6-6T built for the P&R. The first locomotive to have a Wootten firebox was a 4-6-0 built in the Reading, PA shops of the P&R in early 1877. 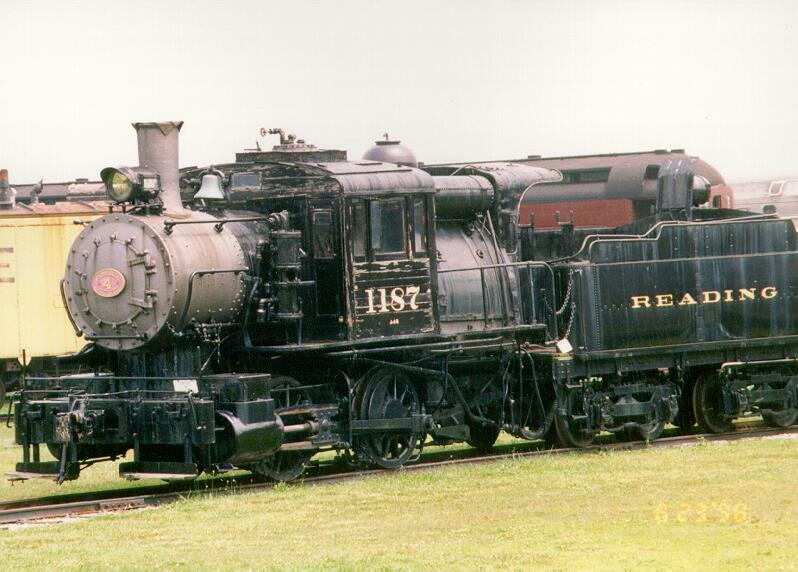 Even though the culm had to be cleaned before it would burn well, the fuel cost savings for a ten wheeler was $2,000.00 a year (about $30,000.00 in 1998 dollars) and by 1883 the P&R had 171 Wootten equipped locomotives. The camelback was an ideal passenger locomotive because the hard coal burned almost without smoke. Some impressive speeds were obtained with these locomotives as very often they would turn in an average speed of under a mile a minute. Five Class P5se P&R "Atlantics" numbers 340, 342, 343, 348 and 349, routinely made the 55.5 mile trip from Camden, NJ to Atlantic City, NJ in under one hour. One of these "Atlantic City Flyers" number 343 ran the trip in 41 minutes, start to stop, in June of 1907. There were many safety concerns with the camelback locomotive. The fireman had a very difficult life, being exposed to the elements and having to balance himself on a moving platform while stoking the fire. The engineer sat over the whirling side rod and had no way to escape should a rod break. Because of the dangers inherant in this design, some unique names for them evolved. On the B&O they were called "Snappers" -- a somewhat funny sounding name for what could be a very serious event (a breaking cross-head or main rod). In 1918, the Interstate Commerce Commission banned further construction of camelbacks, but allowed a few exceptions up to the early 1920s. Finally in 1927, the ICC forbade any more orders for the center cab locomotive on the grounds of safety. A number of these "camelbacks" were rebuilt into end cab locomotives. The Erie mallets, mentioned above, were rebuilt as end-cab 2-8-8-2s. They were used as helpers over the Starucca Viaduct until the late 1920s. Over 40 years (1877 through 1927) almost 3000 Mother Hubbard and camel type locomotives were built. Today only five survive.